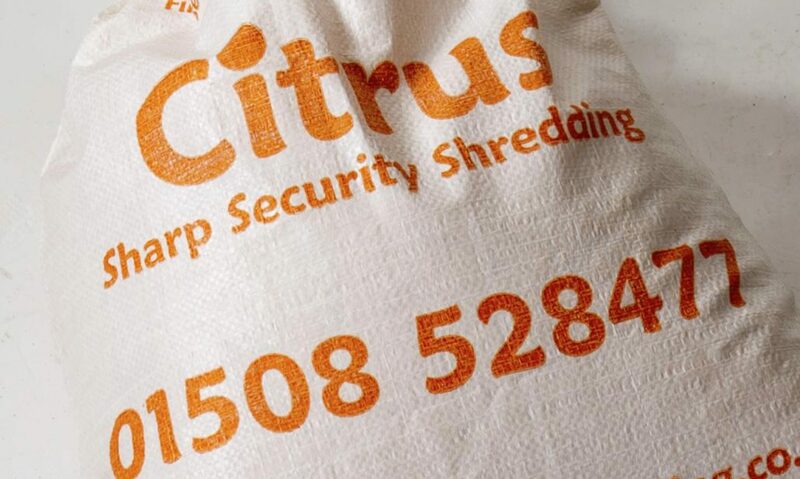 How safe will my confidential data be with Citrus Sharp Security Shredding? Citrus are Licensed Waste Carriers, operating our vehicle fleet and secure shredding facility from a fully licensed depot which is regulated by the Environment Agency. Fully accredited to ISO 27001 Security Techniques & Information Security Management and regularly audited by ISO assessors. All staff, including Directors are regularly CRB (Criminal Record Bureau) and DBS (Disclosure and Barring Service) security checked and carry ID. Vehicles are locked at all times and collections are monitored. All activity within our VERY secure modern shredding facility is monitored with live cameras recording the unloading of vehicles and the operation of shredding machines, to provide our customers with total confidence for complete peace of mind. All confidential documents received are safely shredded and recycled. Citrus also securely destroys photographs, drawings, bank cards, passports and discs, using advanced, crosscut eco efficient specialist data shred machinery. The results of our January 2019 client satisfaction survey are outstanding, receiving 10/10 approval from 98% responses and with 100% of participants stating that they would use us again and would recommend Citrus Sharp security shredding.